Created by SL model and marketer, Seth Diabolito, M E T R O is the fashion mecca for the stylish male avatar. With a focus on helping the men of Second Life look their best, M E T R O offers shoppers three levels of some of the grid’s best brands in clothing, jewelry, shoes, skins, shapes, hair, poses, and more. 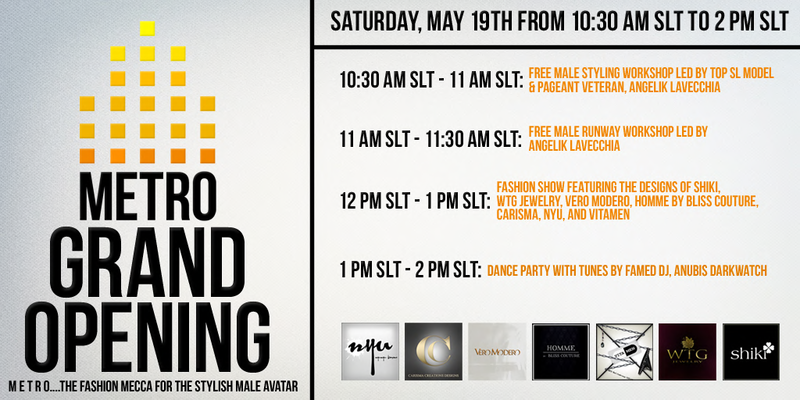 To kick off the arrival of M E T R O onto the SL fashion scene, the Grand Opening event will be held on Saturday, May 19, 2012 from 10:30am SLT to 2pm SLT. Once verified, you will receive a refund for 40% of the amount paid. This is the perfect time to nab some wonderful pieces at a sale price that can’t be beat! Join us for this exciting event and help make M E T R O the new “must-see” shopping destination! M E T R O is the fashion mecca for the stylish male avatar. Here you will find the best brands in men’s clothing, jewelry, shoes, skins, shapes, hair, poses, & more from such designers as Shiki, Vero Modero, HOMME by Bliss Couture, WTG Jewelry, Carisma Creations, American Bazaar, Vitamen, DEF, Nivaro, Birth, Juxtapose and Nyu. I started modeling on May 2010. I am a graduate from Evane and Arcobaleno. I have been in more than 70 runway shows, have done in-store modeling for “Kings and Queens” store and am currently a “Champagne! Sparkling” model. I made some works as a print model, for magazines and vendors. Participated in some contests, being elected Mr. September and SuperElite SuperSearch 2nd Runner UP, “King of November” of the contest “The Royal Crown contest”, and am Mr. Moolto 2011. I had the honor of being nominated “Spokesmodel” of Maniera Ones to Watch 2011 and nominated “Best Male Top Model” on the BOSL awards 2011. I entered Mr. Virtual World contest, mostly cause I like challenges, and this contest it’s not just a huge challenge, but too a big opportunity to test my abilities of Styling and my Personality. To me, Mr. Virtual World can’t be faced just as a status or a desirable title, specially cause all eyes will be on the winner, and most people will see him as a role model. That is a huge responsibility, cause role models are most times responsible for the development of other people personalities and behaviors.